What did you do when you were 18? When I was 18 I graduated high school without a desire in the world. I worked my first real job - getting my hands cut up by sheet metal, my lungs filled with asbestos and my hair filled with fiberglass filaments. I started college, or rather, attended classes at a university for a quarter before transferring to a community college that offered me nothing more than the high school I had just left. I lacked motivation, the most creative thing I did was write my 2nd of what has become 7 "Top 50 Albums of the Year" list, in which I claimed Madvillain to reign supreme. 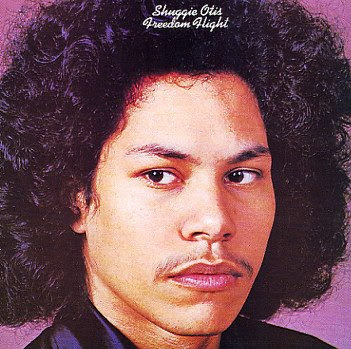 When Shuggie Otis was 18, he released what has become what I consider to be one of the most complete albums of the 70s and perhaps one of my very favorite releases of all time. At it's heart, Freedom Flight is a blues album - but unlike those albums that came before it, it is a blues so forward thinking without sounding entirely alien, it is hard to pinpoint influences or relatable musicians. Blurring the lines between psychedelic, orchestral pop, floor-stomping blues, Hendrix and jamming in a sundazed haze, Shuggie presents 7 tracks (plus a bonus cut) ranging from lengths of 2:30 to 13:00. The longer tracks that close out the album, "Purple" and "Freedom Flight" might very well be the best instrumental rock songs to have come out by this time on albums that were not completely instrumental. Shuggie's guitar playing is essential listening. You can hear influences of Santana and other Woodstock luminaries in his plucking, but perhaps the most striking thing is the direct line you can draw from many of his licks to some of Prince's best moments (and yes I know they look alike). Shuggie will almost certainly be remembered as the kid who wrote "Strawberry Letter 23" which was later popularized by The Brothers Johnson or maybe he will be remembered as the guy who put out Inspiration Information a few years later, inspiring many of the best musicians and jazz groups of the next 20 years. Despite this and despite the legacy of influence that Shuggie has left in his short career (he hasn't recorded much over the last 30 years), I honestly think that Freedom Flight is his most important moment. It's an album that says "hey I can do what you do better than you can, and check this out too..."
Freedom Flight is a treasure of an album, and a vision rarely matched. I always thought that "Inspiration Information" was his magnus opus, I´ll give it a listen. Shuggie Otis is one of a kind, that´s for sure. I mean artistically speaking, it is. I probably misused the phrase in my review. I mean to say I love Inspiration Information a lot as well and think it deserves all the praise it gets, but for whatever reason "Freedom Flight" is just THE Shuggie album for me.